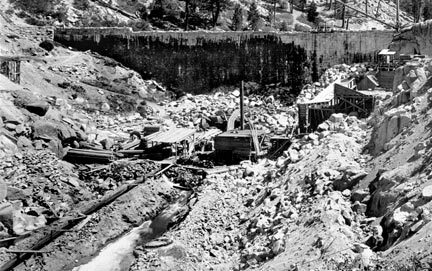 In 1909, the Bear Valley Mutual Water Company accepted John Eastwood’s design for a new dam at Big Bear Lake to replace the original rock dam that had been built in 1885. Eastwood’s unique design called for an all concrete structure without any rock or dirt fill. Eleven concrete buttresses would be built across the gorge about 35 feet apart and about 50 yards downstream from the existing rock dam. Between each of the buttresses a concrete arch would be built. In essence Big Bear would have ten smaller but stronger arch dams across the valley instead of one large one. 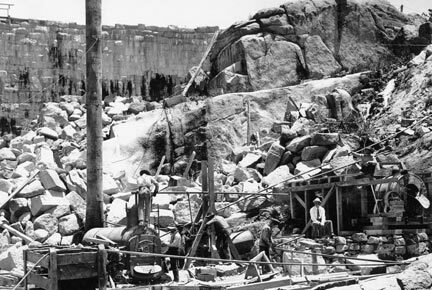 The following photos document the construction of our Big Bear Lake Dam. This is the original rock dam that created Big Bear Lake in 1885. 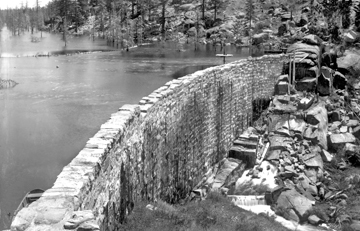 Our current dam was built in 1912, about 50 yards west (to the right) of this structure. — Rick Keppler Collection. Workers are setting up a steam engine on the valley floor to mix concrete. This engine and all the rest of the equipment and materials used in the dam’s construction had to be hauled up by horse drawn wagon from Victorville. The old rock dam can be seen in the upper left. — Rick Keppler Collection. Footings for the concrete buttresses are being cut into the bedrock (lower left). The old rock dam is in the background holding strong against the 5 1/2 mile long Big Bear Lake. — Rick Keppler Collection. Construction of the concrete buttresses has been finished. The work of building the arches that will hold back Big Bear Lake can now begin. — Rick Keppler Collection. By 1911, construction of the arches between the buttresses is nearing completion. The old rock dam can be seen in the foreground, and the steam engine on the valley floor is working over time. — Rick Keppler Collection. 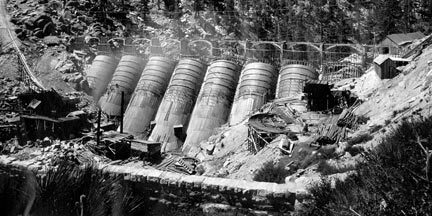 By 1912, the multi arch dam is finished. Notice the man and women standing on the old rock dam. — Rick Keppler Collection. The flood gate on the old rock dam has been opened and the area between the dams is allowed to fill with water. The new dam is 20 feet higher than the old rock dam. When Big Bear Lake is full it will disappear from view. — Rick Keppler Collection. The old rock dam has disappeared completely under water. The additional 20 feet of height of the new dam has increased the holding capacity of Big Bear Lake by 2 1/2 times. — Rick Keppler Collection. 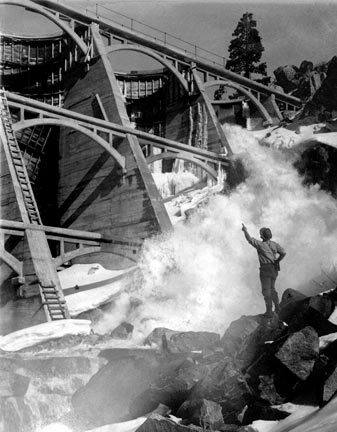 The spillways have been opened on the new dam at Big Bear Lake to supply water to thristy Redlands Citrus Farms. — Rick Keppler Collection. Occasionally the lake level drops low enough to expose the submerged Rock Dam. 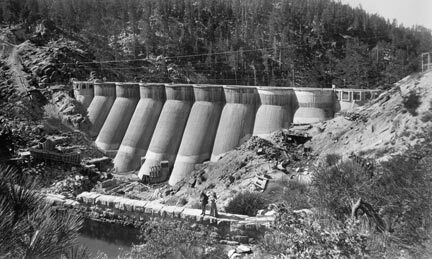 When it does the Rock Dam becomes on of the most popular fishing spots on the lake as in this 1940. – Rick Keppler Collection. Big Bear Lake level rarely drops low enough to expose the old Rock Dam. However in the summer of 2004, the old Rock Dam made an appearance above the waterline for the first time since the early 1960’s. This event was documented in an episode of Channel-6’s Big Bear History Show. The photo below was taken during the production of the show. 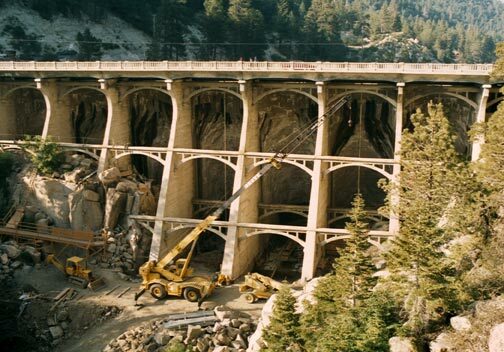 In the mid 1980’s, a state engineering study determined that the Eastwood Dam at Big Bear lake had serious structural problems. 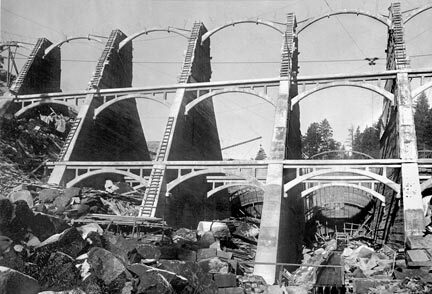 The bridge made it too top heavy.Further investigations were unable to find evidence of any reinforcing iron within the concrete structure.The dam was declared not up to earthquake standards, and therefore unsafe.It was ordered that Big Bear Lake dam would have to be either retrofitted or replaced.It was decided to do a retrofit. 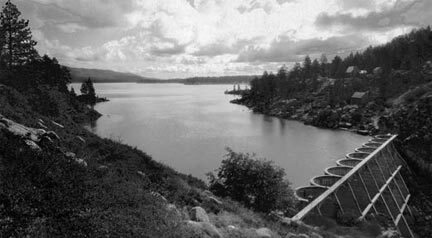 The Eastwood Dam consists of ten small arch dams connected together across the narrow gorge at the east end of Big Bear valley. 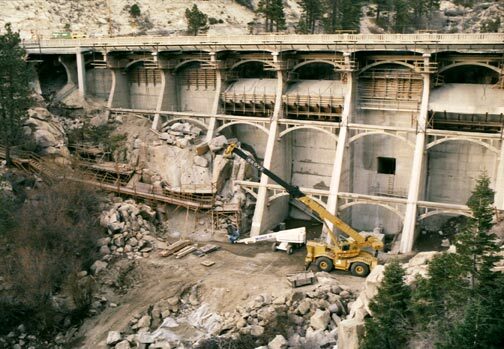 The retrofit project as designed to reinforce each of the arch dams by filling the space between the supporting buttresses with iron bars and massive amounts of concrete. The project began in early 1988, and was finished in 1989 at a cost of about $11,000,000. The following two photos show the construction work at the beginning and near the completion of that project.